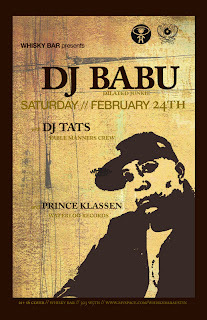 DJ Babu (born Chris Oroc) is a Filipino-American DJ and is a member of the Beat Junkies, a crew of DJs which includes others such as Melo-D, Rhettmatic, and J-Rocc. He is a member of the hip hop group Dilated Peoples, along with Rakaa Iriscience and Evidence. DJ Babu (under the alias "The Turntablist') was the creator of the most widely used Breakbeat album Super Duck Breaks (1996 Stones Throw Records) and its follow-up Super Duper Duck Breaks.